How do I interpret data in SPSS for central tendency and dispersion? Home > How do I interpret data in SPSS for central tendency and dispersion? Analyzing data is great in SPSS. If you entered the correct data points and clicked on the correct analysis it is highly likely that you will have calculated your results correctly. This is a big improvement from hand calculations of the past that we so prone to human error. 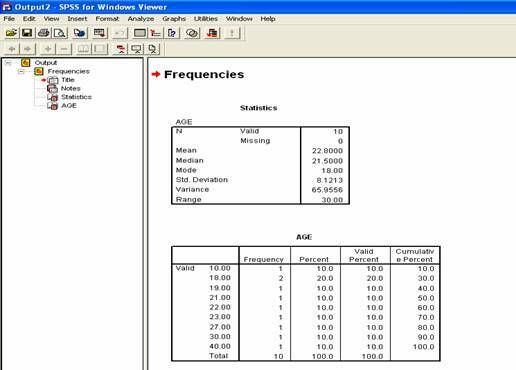 But because SPSS makes your analysis almost fool proof, it has become most important to be able to interpret your results correctly and communicate them to others. You will see two windows in the output file. The window on the right is the one that you should focus on. It will contain the results of your analyses. You will be able to scroll down this window if you have lots of results. The window on the left can help you find the results of particular analyses if you have a long results file. This results file is short so we don’t have to worry about that right now. You can find it in the window on the right hand side of the screen. The Statistics box will have the results for the measures of central tendency and dispersion that you wanted for your variable. It will also have information about the number of data points you entered. The name of the measure will appear on the left and the corresponding value will appear on the right. You can also see that the name of your variable appears in the upper left hand corner of your Statistics box. If you had more than one variable, you would want to check the name to make sure that you are looking in the right box. This stands for number of data points that you entered. In our example we can see that the number of data points entered is 10. The N value is actually pretty useful because many times, people don’t enter in all of the data from their data set. People make mistakes and forget a data point. Or, sometimes people mistakenly add a data point. If we don’t enter in all of the data or if we enter too much data, then we will not get correct results. So check the N value to make sure you have entered in as many points of data as you were expecting to enter. If you find that some data is missing or if you find extra data, it is important for you to close the current output file, go back to the data file, enter the missing data, save the new data file and conduct the analysis again. 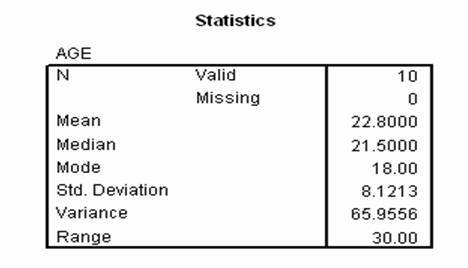 These are all measures of central tendency and are all reported in the top portion of our Statistics box. You can see here that the mean is 22.80, the median is 21.50 and the mode is 18.00. These are all measures of dispersion. They are all reported in the bottom portion of Statistics box. You can see here that the standard deviation (called Std. deviation) is 8.12, the variance is 65.96 and the range is 30.00. If you have ever had to calculate these measures by hand you will have to admit that this is a much easier process.